We specialise in helping people with corneal disease improve their vision. An eye with moderate keratoconus fitted with a rigid scleral contact lens. You can see the contact lens dimly to the right of the cornea. The blue arrows shows the thinned and scarred corneal tissue. Keratoconus is a condition affecting the cornea; the clear front surface of the eye. 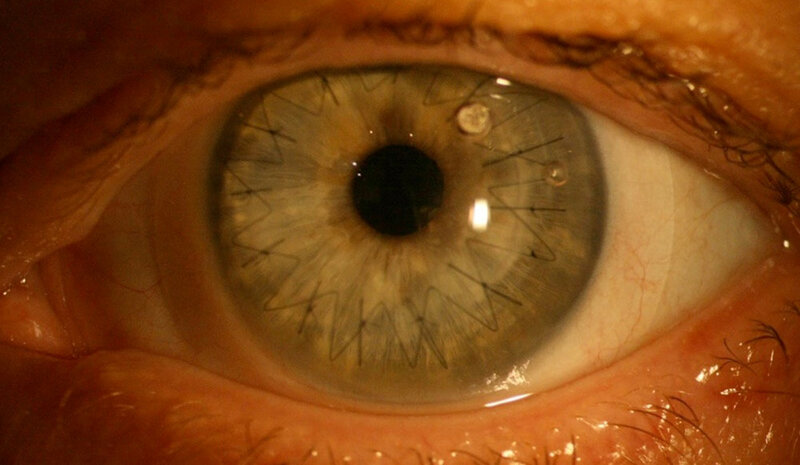 In keratoconus the cornea is thinner which causes it to bulge into an irregular cone-like shape. This causes distorted and blurred vision. In most cases people with keratoconus will still not achieve reasonable vision when they use spectacles or normal soft contact lenses. These people will see best when fitted with customised rigid contact lenses like the ones available from Bay Eye Care. The differnce in the shape of the cornea between a normal eye (top) and keratoconus (bottom). Along with Cyprus, New Zealand has the largest number of people with keratoconus per head of population in the world. Approximately 1 in 1000 New Zealanders have keratoconus, although this number may actually be higher. People who are prone to allergies and eye rubbing are more likely to get keratoconus, as are people with a family history of the condition, and those of Maori or Pacific Island descent. Keratoconus generally starts causing vision problems for people in their early teens and then tends to slowly get worse until their 20s and 30s. At this stage the condition stabilises for most people. Often keratoconus is worse in one eye that the other. Some patients with severe keratoconus may get scarring of their eye which can prevent them from seeing well even with rigid contact lenses. These patients may need a corneal graft surgery to get their sight back. Fortunately these days people with early to moderate keratoconus can have a publically funded procedure carried out called collagen crosslinking. This surgical procedure strengthens the cornea so that it is less likely to thin and distort further. Your optometrist at Bay Eye Care can refer you for this treatment if you are suitable. How do we detect keratoconus? An OCT scan of an eye with keratoconus. Note the thickness of this cornea measures 282 microns. The average normal cornea thickness is double this at around 550 microns. At Bay Eye Care the diagnosis of keratoconus is relatively simple due to the advanced equipment we have available. We have machines that can measure the degree and location of the cone shape on your cornea, scan the cornea to look for thinning and use photography to document the signs of keratoconus that you may exhibit. This technology also allows us to monitor for worsening of your eyes over time, and facilitates accurate fitting of our specialty contact lenses to your eyes. What can be done to improve the vision of someone with keratoconus? An eye with keratoconus fitted with a corneal rigid contact lens. The main treatment to help someone with keratoconus see clearly is to use a customised rigid contact lens. A rigid lens does not drape on the eye like a normal soft lens. Instead it holds its shape and masks the distorted cornea it rests on. There are several different types of rigid lens that can be fitting to a eye with keratoconus. You optometrist will discuss these options with you and the best lens for you depends on the severity of the condition, the presence of other ocular disease and factors like your occupation and lifestyle. More information about specialty contact lenses can be found here. A partial subsidy towards the fitting charges and the cost of contact lenses is available from the Ministry of Health for people with keratoconus that meet certain criteria. Your optometrist will advise you if this subsidy is available for you based on your examination findings. Keratoconus is not the only condition that causes a distorted cornea, however it is the most common. Pellucid Marginal Degeneration (PMD) is a condition that causes thinning to the edge of the cornea. It tends to occur in middle aged people. Like keratoconus people with PMD see best with a rigid contact lens. Following a corneal graft (having a healthy cornea from a human donor replace your own, also known as a keratoplasty) or after ocular trauma the surface of your eye can be quite distorted and require a rigid contact lens to see optimally.